Amazon.com description: Product Description: Originally published between 1909 and 1917 under the name "Harvard Classics," this stupendous 51-volume set-a collection of the greatest writings from literature, philosophy, history, and mythology-was assembled by American academic CHARLES WILLIAM ELIOT (1834-1926), Harvard University's longest-serving president. Also known as "Dr. Eliot's Five Foot Shelf," it represented Eliot's belief that a basic liberal education could be gleaned by reading from an anthology of works that could fit on five feet of bookshelf. Volume XXIX is the legendary travel adventure and naturalist's diary by English scientist, naturalist, and geologist CHARLES DARWIN (1809-1882), which features the research and observations that formed the basis for his revolutionary 1859 work, On the Origin of Species. 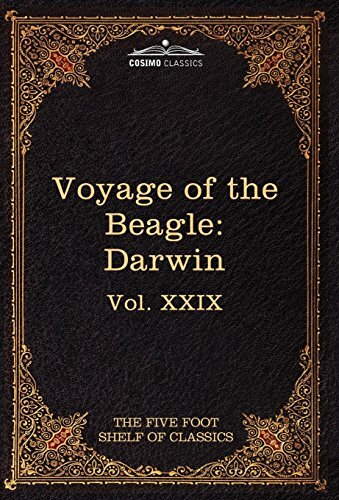 First published in 1839 under the title Journal and Remarks, The Voyage of the Beagle is the enthralling account of the five-year journey he undertook on the HMS Beagle, an English exploratory vessel, which sailed South America and the South Pacific from 1831 to 1836. It is even more fascinating for the hints it offers of Darwin's thought processes, which would later forever change the field of biology.